Baby Cakes, aka IZA Baby Cakes, is a petite 3-year-old dark brindle female, born November 27, 1999. Baby Cakes raced at Geneva Lakes, WI and Victoryland, AL from July 2001 to March 2002. She wasn't good at taking the turns, so here she is--ready to turn into a couch potato! Baby Cakes is described as being very outgoing and happy. Dutch Bahama is Baby Cakes' great grandfather and HB's Commander is her granddad. 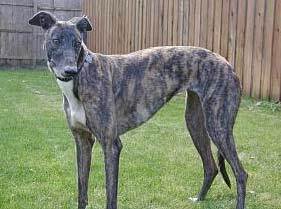 She is very laid back, sweet and gets along well with other greyhounds. Baby Cakes appears to be cat and small animal tolerant. Baby Cakes has definitely added another dimension to our home. Guinan, our 11 1/2 year old didn't know quite how to take her at first but has grown accustomed to her never-ending curiosity and boundless energy. "Babe" as we call her is a petite female full of energy, much love and lots of hugs and kisses. To her, "everyday is a holiday and every meal a feast!" She has definitely made a game out of being inside a house. She mastered the stairs in minutes and knew her way around the house within an hour. With three different floor surfaces in our house, she sometimes forgets to slow down a bit when she hits the wood but has managed to turn that into a game as well. She has also done a "stellar" job of finding her own place in a house with 3 indoor cats and 4 outdoor cats who love to tease her. At this time, she is showing no aggressiveness or interest in our feline "borders" and can be pretty much "certified" as cat tolerant. I believe, at times, she is much more tolerant of the cats and kittens than I am. She is teaching me to "take a deep breath" and ignore them until they go away.